so for me, the best solution currently is to use Intel compiler and debugger in Linux. The debugger is called “idb”. You can download freely from intel website. the location will depend on where you install the compiler and the debugger. 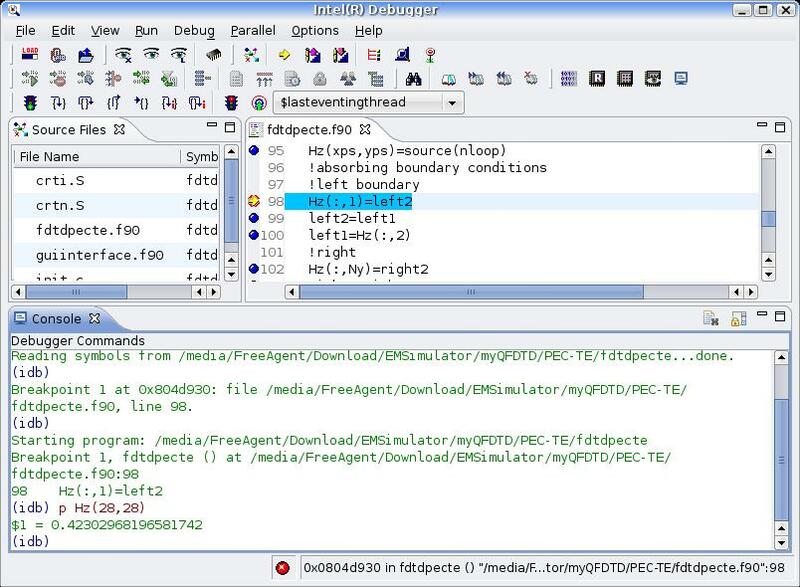 To start debug, click “File->Load executable”, and choose the executable which has been compiled using Ifort. To view the source as well, click “View->Source Files”. Below is the snapshot of the debugger. I used Kubuntu 8.04. In a previous post, I shared some Octave functions to do debugging. Somehow I got problem in using dbstop function in my main script. It kept on telling me it can’t find the function. However, I found another useful way to stop the program and enter into debug mode. It’s to use the “keyboard” function. This function is normally used for simple debugging. When the keyboard function is executed, Octave prints a prompt and waits for user input. The input strings are then evaluated and the results are printed. This makes it possible to examine the values of variables within a function, and to assign new values to variables. No value is returned from the keyboard function, and it continues to prompt for input until the user types ‘quit’, or ‘exit’. If keyboard is invoked without any arguments, a default prompt of ‘debug> ’ is used. so what you need to do is just to insert “keyboard” into the line where you want to stop. That easy! this is to enter debug mode in Octave whenever a warning or error occurs. where 1 is the line number where you want to stop. to see the variable value, just type the name of the variable.